Hi there. This page is dedicated to (to me) the two best F1 drivers ever, Ayrton Senna and Gilles Villeneuve. Both were the best of their eras, both were more dedicated, faster, more determined and more aggressive than any other driver on the grid when they were racing, and both were loved around the world. 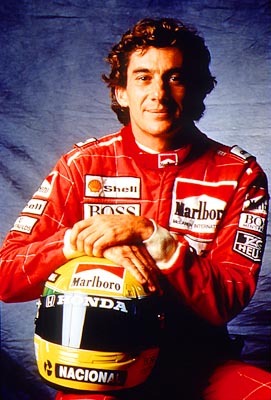 Senna was probably the fastest driver ever in F1, and his commitment, speed, stats and presence spoke for themeselves. His belief in himself sometimes bordered on the insane, and there was no one more willing to win than Ayrton. Other drivers often felt more than a bit scared of the intimidating red and white Mclaren with the bright yellow helmet when it came into their mirrors, mainly because Ayrton would drive over them than around them. Gilles was one of the fastest and definately the most specatacular driver F1 has ever seen. A daredevil with unshakable self belief and only one thought: win. The laws of physics and the term 'give up' didn't exist fro him. This didn't mean that Gilles was unfair or intimidating. He was always fair but an extremely hard and committed racer. I'm not about to start dishing dirt on these two guys, they deserve more respect than people poking around their private lives. That sounded preachy, sorry! Why these two, I hear you ask. Well these two, along with James Hunt and Barry Sheene are my heroes from the world of motorsport. I also think that F1 was robbed in 1982 when Gilles died. If he'd lived, he would easily have been world champion that season, and also we would have seen him race against Senna in later seasons. Ayrton said himself he would have liked to race against Gilles! The Ayrton Senna Foundation, set up by Ayrton with his family holds the licence to produce items on Senna. At the mo, you can pick up models, clothes, videos, books and DVDs devoted to Ayrton, all of which are a bit expensive but I think are worth it. Just released is the Official Ayrton Senna DVD which covers just about everything to do with him, and is well worth buying, replacing the equally good A Star Named Ayrton Senna video. 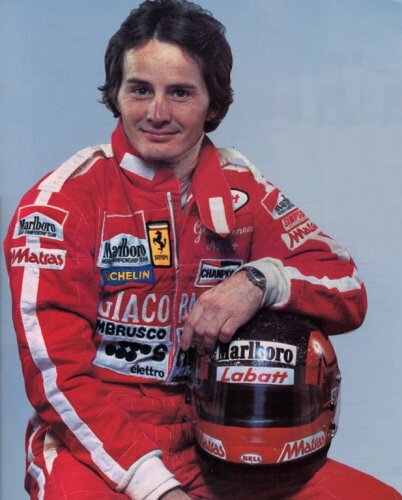 Gilles Villeneuve has a museum near his home town of Berthierville, which has it's own website (see links) which is well worth going to have a look at. Brumm models do a fairly cheap model of the 126C2, but clothing items are hard to find, and you're best off looking on ebay for these. The same author that wrote the James Hunt biography wrote a very good book on Gilles which is worth finding, and there is a video on him which is worth watching too. I respect Prost, Scheckter, Stewart, Fittipaldi, Damon Hill, Peterson, Nuvolari and Brabham as well.